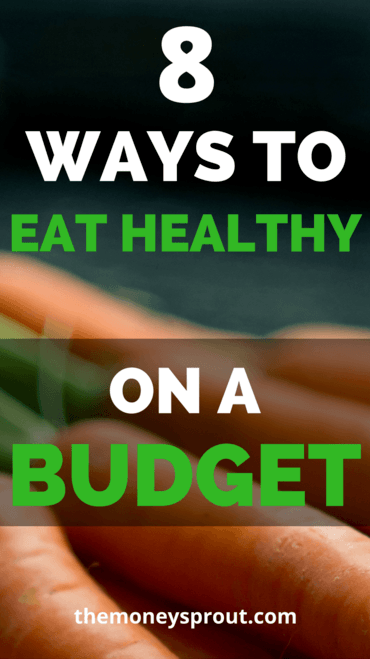 Contrary to what you may be thinking … it is possible to eat healthy on a budget. Yes, you are likely going to spend more money on food if you want to eat healthy. But there are several ways to minimize the costs, so that you can put the best possible food into your body. Personally, I would much rather spend a little bit more each month on organic, whole foods than higher medical costs in the future. Eating cheaper foods that are heavily processed are known to cause a variety of complications as you age. From diabetes to heart disease (and more) … low quality foods can contribute to problems like these overtime. And those health issues (like diabetes) will result in higher doctors bills, prescriptions, etc. So why wouldn’t you want to invest in your health now and spend a few extra bucks on nutritious, organic foods instead of paying for it in the future with higher medical expenses? If you are looking for ways to eat healthy on a budget … here are 8 tips you can start with today. This is one of the best ways to eat healthy on a budget. It sounds so obvious, yet people often forget just how expensive eating at restaurants can be. With some proper meal planning, you can start to cook your own food and save a bunch of money. And not only will you save a ton of money by cooking your own food … chances are it will be much more nutritious. As long as you cook with natural, unprocessed ingredients … you are automatically going to be eating much healthier food. When you let someone else prepare your food, you just don’t always know how safe and healthy the ingredients are. There is no doubt that cooking with processed ingredients will be cheaper than using whole, unprocessed foods. However, there are some options to minimize your costs … while still eating healthy. For example, we know that eating a ton of leafy green vegetables is great for a healthy lifestyle. We also know that eating some fruits can be beneficial along with healthy fats and meat. But overall, vegetables are going to be cheaper than meat. So if you can base your meals around vegetables first, you are likely going to save a ton of money. Fruits, meat, and nuts can be added in … but sparingly. This will not only help you get most of the nutrients your body needs from veggies … but will also be much cheaper. Just remember not to be tempted to save money on your food budget by adding in a bunch of processed ingredients. That will almost always get you short term savings but could lead to medical problems down the road. And those future medical costs will almost certainly be much larger than your short term savings. My kids always seem to want to buy watermelon in the winter. They love watermelon and could eat it year round. But that doesn’t mean we go out and pay a premium during the winter so they can eat it. Shopping for only seasonal produce just makes good sense. First, produce that is in season in your area will likely always be cheaper. It is all about supply and demand. Second … and maybe more important … seasonal produce will contain more nutrients that are healthy for your body. Buying produce that is shipped from thousands of miles away that is out of season won’t be as healthy. Buying local and seasonal produce will be cheaper, healthier, and more environmentally friendly. In a perfect world, every item of food that we buy would be organic. But unfortunately, buying organic usually means spending a lot more money on the food you are eating. Since eating healthy requires that you consume a lot of vegetables and some fruits, it is important to understand the high level of chemicals that can be found in produce. Fortunately, the Environmental Working Group (EWG) publishes an annual list of the top 12+ produce items that you should buy organic. The Dirty Dozen list (as it is called) are those fruits and vegetables with the highest amounts of pesticide residues from non-organic sources. So if you can’t afford organic produce all the time, then narrow down your options to the list. And if you have to spend less on non-organic produce, then choose fruits or vegetables not on the Dirty Dozen. Better yet … spend your money on the Clean Fifteen … see below. The Environmental Working Group also publishes an annual list they refer to as the Clean Fifteen. This list of produce was found to contain the least amount of pesticide residues. So if you are trying to save money but want to buy the healthiest foods … consider buying non-organic options for produce found on the Clean 15. Of course, if you don’t mind spending the extra money … purchasing all organic fruits and vegetables is ideal. But it isn’t always practical. Instead of worrying about buying organic and where your food is coming from … you could always consider growing your own food. Our family started a summer garden just this past year. We grew several vegetables including tomatoes (2 different kinds), onions, lettuce, radishes, cucumbers, carrots, and peppers. Just for fun, we also experimented with growing cantaloupe which actually turned out pretty good. Are we able to grow enough food to feed our family from our garden? Not a chance. But overall, we will save a little money this year and likely more next summer as we learn how to grow our own food. Unless you live on a farm or have a bunch of property, you are likely not going to be able to grow and produce all your own food. However, it doesn’t take a ton of space to grow some vegetables and fruits to help save some money on your grocery budget. Plus, by growing your own food, you know exactly where it came from and there is a good chance it will be much healthier for you. Have you heard of intermittent fasting? This proven weight loss strategy can help you lose fat, gain muscle, and live healthy! There are several different ways to fast. Some are extreme while others like the 16:8 method is not too hard and may actually help you save money. The 16:8 fasting protocol requires you to fast for a period of 16 hours a day, while eating your meals during the remaining 8 hour window. On the surface, it may sound difficult to avoid eating for 16 straight hours. However, if you plan out your meals it isn’t all too difficult. One of the most popular strategies is to fast from 8 PM until 12 PM the following day. So assuming you finish eating dinner before 8 PM in the evening, you would need to skip breakfast the next day and wait until lunch for you next meal. Of course, this means that you cannot snack in the evening (after 8 PM), or in the morning after waking up. But if you get 8 hours of sleep, you are already cutting out half of your fast! Regardless of the fasting protocol you choose, you not only can drastically improve your health … you can also save money by skipping meals. For example, if you follow the 16:8 fasting protocol, you don’t need to worry about eating breakfast. Note – my wife and I have followed the 16:8 fasting protocol several times and have had lots of success. We have found that even though we skip breakfast … we still eat our normal meals in the other 8 hours without having to eat extra food. Our family has done a few rounds of the popular healthy lifestyle program known as the Whole30. This healthy eating program lasts 30 days and limits foods you can eat like – grains, legumes, alcohol, dairy, etc. It also promotes eating vegetables, fruits, nuts, healthy fats, and lean meats. Basically while on the program, you should eat whole foods that contain the nutrients your body requires in place of less nutrient dense foods that are heavily processed. Whether you decide to do your own round of the Whole30, follow the Paleo Diet, or even the Keto diet … you need to be prepared if you want to save money. The only way that our family made it through the Whole30 multiple times was to be prepared. We planned out our healthy meals throughout the week and did meal prep in advance whenever possible. I can’t stress the importance of meal prep enough when it comes to eating healthy and saving money! If you are serious about saving money, then it makes sense to start taking care of your most important asset – your body. Investing in your health now by eating healthy foods will help you minimize your future medical costs and prescriptions. Even though it may cost a little more to buy healthy foods … it is an investment my family is willing to make. Plus there are several ways you can help to minimize the cost of eating healthy. 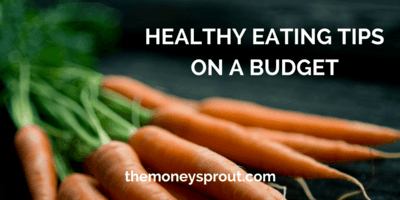 What other tips can you provide to eat healthy on a budget?